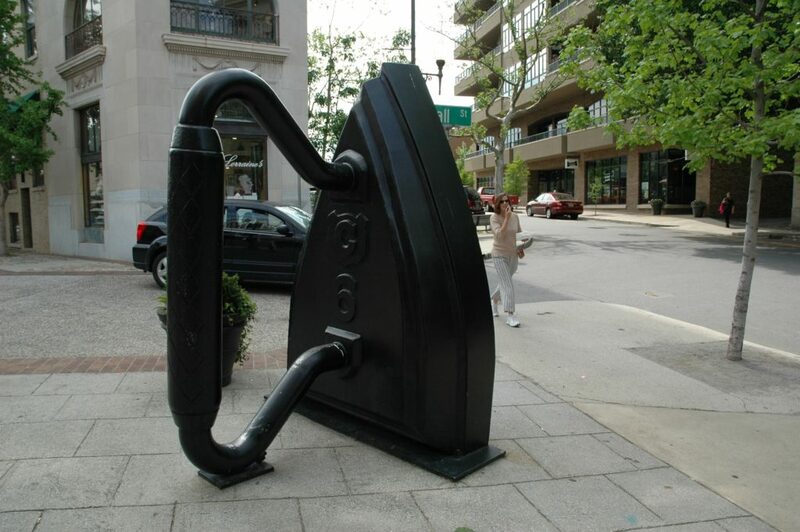 A large iron sculpture by artist Reed Todd on Battery Park Ave, opposite to the Haywood Park Hotel. Photo by stantontcady / Flickr. The Asheville Urban Trail is an entertaining, informative, and artistic walk through Asheville’s history. It’s 1.7-miles of architecture and memories from earlier times in this engaging mountain city. Started in 1991 by a group of dedicated volunteers who were determined to put downtown Asheville’s best foot forward, the Asheville Urban Trail has evolved into a fairly complete walking tour of Asheville’s historic and present day world. Although the complete trail is not particularly long, time constraints and weather can make a shorter walk more enjoyable. It can be made as short and easy as 0.2-mile by simply covering just part of the trail, which is divided into different time periods, instead of the entire trail. But the Urban Trail is so interesting, most walkers will be inspired to follow the it from beginning to end. Downtown Asheville’s Pack Square, in front of the Asheville Art Museum. Photo by bnilsen / Pixabay. The trail begins in front of the Asheville Art Museum, which is located on Pack Square. Here, trail participants listen to the story of Asheville’s earliest days as a backcountry settlement, which, from descriptions from the period, was almost as hard to get into or out of as Antarctica. During this frontier period of the late 1700s and early 1800s, just over 1,000 people lived in this small, remote village, which was originally named Morristown. However, after a petition to the North Carolina General Assembly in 1792 to form their own county, the town was renamed Asheville in honor of North Carolina’s popular governor Samuel Ashe. The county was named Buncombe, after Revolutionary War hero Edward Buncombe. But Asheville’s old, muddy, seasonally-unusable dirt paths slowly gave way to the rough-planked Buncombe Turnpike which, in turn, gave way to rail travel by the 1880s. With the coming of the railroad, Asheville started to experience tremendous growth and development. Within a decade, Asheville’s population quadrupled. 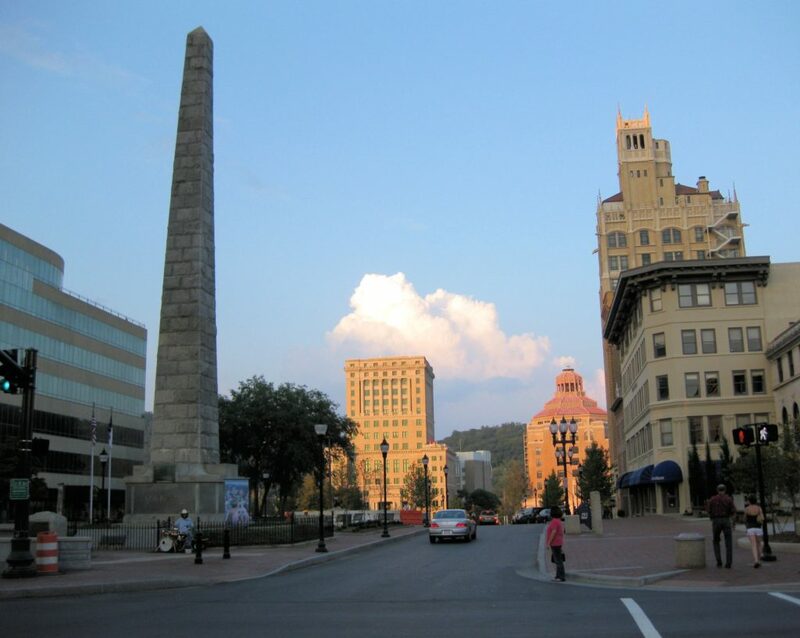 In 1883, Asheville became a city. The first streetlights went up in 1888, and the first electric streetcars came in 1889, making Asheville the second city in the US to have electric streetcars (the first city was Richmond, Virginia, by the way). Other points along the Urban Trail make note of the Buncombe Turnpike’s significance as well as the railroad’s importance to the commerce and development of this community in the mountains. From the 1880s through the 1930s, Asheville’s climate was considered ideal for the treatment of many illnesses, particularly tuberculosis, and many a wealthy Easterner found his and her way to this lovely mountain city. Many of these same people built some of the most beautiful buildings the city has to offer, and the Urban Trail is probably the easiest way to see most of them at close range and at a leisurely pace. The City Building (1928), the S&W Building (1929), and First Baptist Church, all staggeringly beautiful examples of Art Deco master architect Douglas Ellington, are on the trail. Grove Arcade, the vision of E. W. Grove and the first indoor mall in America, is located just south of the Battery Park Hotel (now devoted to housing for seniors). A tribute to the downtown contributions of Englishman Richard Sharp Smith, the supervising architect of the Biltmore House who fell in love with Asheville and made it his home for many years following its completion, can be found on Broadway. 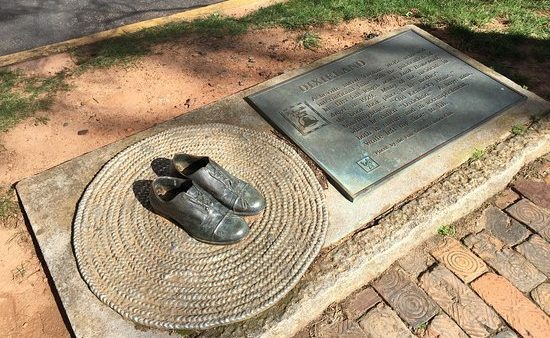 A sculpture of Thomas Wolfe’s shoes on the Asheville Urban Trail. Photo by Susan F. / Tripadvisor. Eagle Street, known as “The Block” and which has recently undergone significant restoration, is honored with a bronze wall sculpture as the historic center of the African-American community. This work was based on the collective memories of former residents who recall the days when Eagle Street was a place to live, shop, or meet friends after school. A printable map of the Asheville Urban Trail is provided by Explore Asheville. There’s also a companion audio tour and a comprehensive scavenger hunt. For more information please visit the City of Asheville’s Urban Trail website.